Nepticula rubivora Wocke, 1860. Jahrsb. Scless. Ges. : 132. Leaf-miner: A contorted gallery with dispersed frass, leading to a blotch (British leafminers). Egg at the underside of the leaf. The mine is a highly contorted gallery, strongly widening towards the end. Frass in the second half of the gallery dispersed. The larva mines venter upwards. Mostly several mines in a leaf (Bladmineerders van Europa). 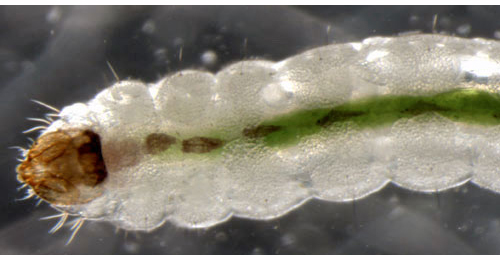 Larva greenish-white with green gut-line and brown head (British leafminers). The larva is also illustrated in Bladmineerders van Europa. Time of year - larvae: October (British leafminers). Distribution in Great Britain and Ireland: Britain including Bedfordshire, Buckinghamshire, Cambridgeshire, East Suffolk, Huntingdonshire, North Hampshire, North Somerset, West Gloucestershire, West Norfolk and West Suffolk (NBN Atlas). Distribution elsewhere: Widespread in continental Europe including Austria, Belgium, Bosnia and Herzegovina, Croatia, Czech Republic, Danish mainland, Estonia, Finland, French mainland, Germany, Hungary, Italian mainland, Latvia, Lithuania, ? Norwegian mainland, Poland, Romania, Russia - Central, Slovakia, Slovenia, Sweden, Switzerland, The Netherlands, Ukraine and Yugoslavia (Karsholt and van Nieukerken in Fauna Europaea).